Earlier this week, a strange silhouette appeared on one of the early pictures taken by the Mars Curiosity rover's Hazard-Avoidance Cams. Shortly after that picture was taken, the mysterious shadow was gone, causing a firestorm among conspiracy theorists worldwide. According to NASA, it was the impact plume created by the sky crane's crash on the Martian surface. The images shown in this animated GIF were taken 45 minutes apart, which explains why you can see the impact plume on the first but it's gone on the second. 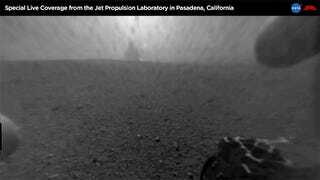 Gizmodo has been covering the Mars Curiosity rover live from the Jet Propulsion Laboratory in Pasadena, California. Check all the articles here.